This booklet tells you how to use the R statistical software to carry out some simple analyses using Bayesian statistics. This booklet assumes that the reader has some basic knowledge of Bayesian statistics, and the principal focus of the booklet is not to explain Bayesian statistics, but rather to explain how to carry out these analyses using R.
If you are new to Bayesian statistics, and want to learn more about any of the concepts presented here, I would highly recommend the Open University book “Bayesian Statistics” (product code M249/04), which you might be able to get from from the University Book Search. There is a pdf version of this booklet available at https://media.readthedocs.org/pdf/a-little-book-of-r-for-bayesian-statistics/latest/a-little-book-of-r-for-bayesian-statistics.pdf. If you like this booklet, you may also like to check out my booklets on using R for biomedical statistics, http://a-little-book-of-r-for-biomedical-statistics.readthedocs.org/, using R for time series analysis, http://a-little-book-of-r-for-time-series.readthedocs.org/, and using R for multivariate analysis, http://little-book-of-r-for-multivariate-analysis.readthedocs.org/. Bayesian analysis can be useful for estimating a proportion, when you have some rough idea of what the value of the proportion is, but have relatively little data. An appropriate prior to use for a proportion is a Beta prior. For example, if you want to estimate the proportion of people like chocolate, you might have a rough idea that the most likely value is around 0.85, but that the proportion is unlikely to be smaller than 0.60 or bigger than 0.95. We can then use the findBeta() function below to find the most appropriate Beta prior to use. 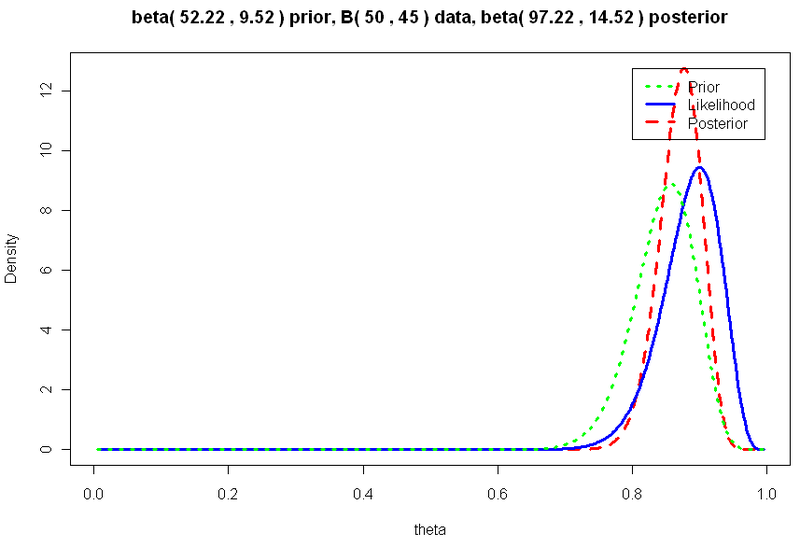 To use the findBeta() function, you first need to copy and paste it into R. The findBeta() function makes use of the beta.select() function from the LearnBayes R package, so you first need to install the LearnBayes package (for instructions on how to install an R package, see How to install an R package). "The best beta prior has a= 52.22 b= 9.52105105105105"
This tells us that the most appropriate prior to use for the proportion of individuals who like chocolate is a Beta prior with a=52.22 and b=9.52, that is, a Beta(52.22, 9.52) prior. Note that in the command above we use the “dbeta()” function to specify that the density of a Beta(52.22,9.52105105105105) distribution. 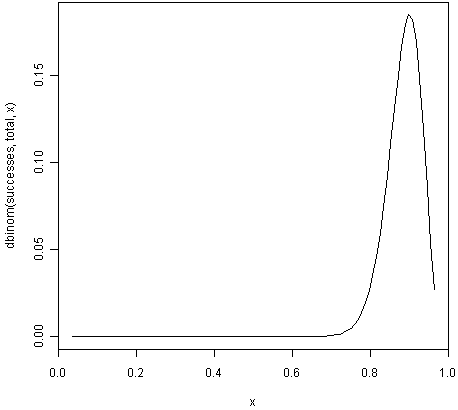 We can see from the picture of the density for a Beta(52.22,9.52105105105105) distribution that it represents our prior beliefs about the proportion of people who like chocolate fairly well, as the peak of the distribution is at about 0.85, and the density lies almost entirely between about 0.68 and 0.97. Say you want to estimate a proportion, and you have a small data set that you can use for this purpose. For example, if you want to estimate the proportion of people who like chocolate, you may have carried out a survey of 50 people, and found that 45 say that they like chocolate. This small data set can be used to calculate the conditional p.m.f. (probability mass function) of the proportion given the observed data. This is called the likelihood function. It represents how likely the possible values of the proportion are, given the observed data. The function calcLikelihoodForProportion() takes two input arguments: the number of successes observed in the sample (eg. the number of people who like chocolate in the sample), and the total sample size. You can see that the likelihood function is being calculated using the Binomial distribution (using the R “dbinom()” function). That is, the likelihood function is the probability mass function of a B(total,successes) distribution, that is, of a Binomial distribution where the we observe “successes” successes out of a sample of “total” observations in total. 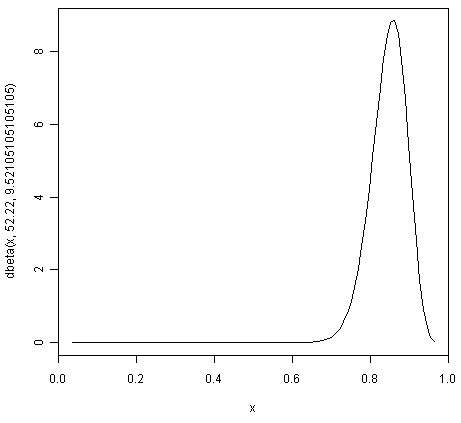 You can see that the peak of the likelihood distribution is at 0.9, which is equal to the sample mean (45/50 = 0.9). In other words, the most likely value of the proportion, given the observed data, is 0.9. Say you are trying to estimate a proportion, and have a prior distribution representing your beliefs about the value of that proportion. If you have collected some data, you can also calculate the likelihood function for the proportion given the data. However, after observing the data, you may wish to update the prior distribution for the proportion, taking the data into consideration. That is, you may wish to calculate the conditional distribution of the proportion given the data and the prior. This is is called the posterior distribution for the proportion. The posterior distribution ssummarises what is known about the proportion after the data has been observed, and combines the information from the prior and the data. To use the “calcPosteriorForProportion()” function, you will first need to copy and paste it into R. It takes four arguments: the number of successes and total sample size in your data set, and the a and b values for your Beta prior. "mode for prior= 0.857381988617342 , for likelihood= 0.9 , for posterior= 0.876799708401677"
 "mean for prior= 0.845804988662132 , for likelihood= 0.884615384615385 , for posterior= 0.870055485949526"
 "sd for prior= 0.0455929848904483 , for likelihood= 0.0438847130123102 , for posterior= 0.0316674748482802"
Since the prior and posterior are distributions, the area under their densities is 1. The likelihood has been scaled so that the area underneath it is also 1, so that it is easy to compare the likelihood with the prior and posterior. Therefore, the prior and likelihood curves should look the same shape as those plotted before (see above), but the y-axis scale is different for the likelihood scale compared to the plot made using calcLikelihoodForProportion() above. Note that the peak of the posterior always lies somewhere between the peaks of the prior and the likelihood, because it combines information from the prior and the likelihood (which is based on the data). In our example of estimating the proportion of people who like chocolate, the peak of the posterior is roughly half-way between the peaks of the likelihood and prior, indicating that the prior and the data contribute roughly equally to the posterior. To learn about Bayesian Statistics, I would highly recommend the book “Bayesian Statistics” (product code M249/04) by the Open University, available from the Open University Shop. There is a book available in the “Use R!” series on using R for multivariate analyses, Bayesian Computation with R by Jim Albert. Many of the examples in this booklet are inspired by examples in the excellent Open University book, “Bayesian Statistics” (product code M249/04), available from the Open University Shop. © Copyright 2010, Avril Coghlan. Created using Sphinx 1.5.6.